True Grit: Digerati Go Western? Millennials Go “Back in the Day”? How many times can you say “Glauber” without wondering where such a funny name comes from? A Google experiment (try just typing in “Glauber”) shows that the Brazilian filmmaker is as famous today as his namesake, the German scientist Johann Rudolf Glauber, discoverer of Sodium Sulfate. It was Dona Lúcia, Rocha’s mother and until this day a tireless supporter of her son’s legacy, that gave him the odd name. It wasn’t the only thing that made him stick out, 20-odd years later, when, surrounded by the Walters, Luizs, and Joaquims, the Nelsons, Leons, and Paulos, he became one of the great filmmakers of his generation. Widely heard-of though seldom seen, Rocha’s films are among the hardest to place in the canon of new cinemas from the 1960s. A tricontinental artist – he made films not just in Brazil but in Europe and Africa – Rocha was the victim of his own transience; he revelled in contradictions, in his aggressive theorising and self-attributed “aesthetic of hunger” (1) – which took him from third-world-isation to the forefront of international filmmaking. From Terra em transe (1967) (2) on, Rocha’s films resemble the didacticism of Godard’s Dziga-Vertov period, but damn if they were ever as detached from their causes as those films, so stilted in their narration, so caught in their time that – as the years have proved – they’ve barely moved forward at all. When Rocha made films, they were to reach Brazil in depths that no one had yet dreamt of. And if time has not been gentler to Rocha, we’ve reason to be optimistic: his premature death at age 42 has never sat well with the Brazilian people (3), and he’s remembered, almost obsessively, with constant revivals, re-editions of books, and a number of studies and rankings (Deus e o Diabo na Terra do Sol  was named the greatest Brazilian film of all time (4)). 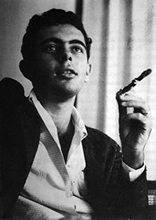 His rise from cult figure to the cultural frontlines of Brazil – where he is known simply as Glauber – is not without precedence: he was analytical to the point of ambiguity (Terra em transe is a great film on party ambiguity); he engaged with literary (Jorge Amado), political (José Sarney), and artistic (Di Cavalcanti) figures; he was a critic and journalist before becoming a filmmaker (two of his books on cinema have just entered into circulation again in Brazil); and his final film was, among many things, an homage to lesser known Brazilian filmmakers like Julio Bressane and Rogério Sganzerla, who worked in more experimental forms. Rocha was highly visible if not always well-liked, and his lingering influence suggests Brazilian cinema still hasn’t found an inheritor to his highly charged place. Unfortunately, Rocha’s reputation in Brazil has built up expectations elsewhere. His films were never “dazzling” in the way Bertolucci’s films from the period were; nor did they betray their radicalism to meet arthouse conventions (as Costa-Gavras’ films did). The result is that the reputation of his films is disproportionate to their aesthetic extremism. For the sake of comparison, it’s as if Robert Kramer held the place of Martin Scorsese in the US, or if in Italy Marco Bellocchio were as famous as Federico Fellini. Rocha simply had too much nerve to make his films accessible. Today he is studied in classes but hardly seen in cinémathèques. Film history has never let him be as free as Rossellini or Godard – who he admired – yet Rocha merits consideration as much as these major figures. He wasn’t the first Brazilian director to be represented abroad – hardly. 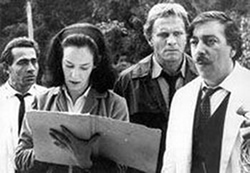 But it wasn’t until the late ’60s – after making three feature films and commencing a fourth – that Rocha had become renowned, and at that point he was not alone: Joaquim Pedro de Andrade, Walter Lima Junior, Paulo César Saraceni, Ruy Guerra, Luiz Carlos Barreto, and Carlos Diegues, among others, had joined him (5). In a recent interview (6), Godard said that he considers himself to be someone who started making films “late in life” (7). Godard is obviously balancing himself against those who were born into or began making movies as jobs: Dwan, Ulmer, Vidor, etc. Glauber Rocha, in contrast, was a culturally active youth in his native state of Bahia and a published journalist by his late teens. Some sources (8) even point to his being at the centre of Bahian cultural life at the start of the ’60s. His first short was directed when he was 20, and although he only lived to be 42, his output was by no means short of plentiful: ten feature films, six shorts, a good number of books and essays, and various half- or never-realised film and television projects that can be expected of someone so creative and exasperatingly active. Rocha never squandered a moment of his life after he became a director – you could say he was “born” into it at 20, and never looked back. Rocha’s relationship to Brazilian cinema begins in the ’30s, with Mario Peixoto’s legendary Limite and Humberto Mauro’s lesser-cited Ganga Bruta. He famously disparaged the former in an article from A Critical Revision of Brazilian Cinema (9), writing “…in its mise-en-scène is the moral of the author…the moral of the Brazilian cinema is fatally grounded in the revolutionary…Limite is the substitution of an objective reality for an internal mindset; a formalist and socially deceptive mindset…” (10). Ganga Bruta is placed in direct opposition: “If Limite corresponds to a symptom of vanguard French cinema and reveals an artist impregnated with his own subjective aestheticism, Ganga Bruta not only corresponds to the poetic symptoms of Vigo and Flaherty, but is also confined to a reality that doesn’t limit its intentional language.” Hence, as the title of his book starts to imply, Rocha’s militancy towards a national cinema was as true as authors Sady Cabral and Carlos Drummond’s (11) were to poetry, or Graciliano Ramos’ (12) was to the novel, etc., and was already apparent in these early essays. In his autobiographical writings, Rocha states it was the impact of seeing Nelson Pereiro dos Santos’ Rio, 40 graus (1955) – in his A Critical Revision… he would write that it was the “fertilisation point of the Cinema Novo” – that stirred his desire to make films. Two years later he visited the set of Santos’ Rio Zona Norte (1957), and at that moment – married, with a daughter, and technically still a student – Rocha began to strategically make himself known in the film community. He made Pátio (1959) on money he had borrowed over the course of a year, and toured it to various cities. In 1960, he took a job as production manager on a feature, and because of various disputes with director Luiz Paulino dos Santos, the project was eventually completed by Rocha. The accidental calling card that came of it was Barravento (1961). Since now I will begin to talk about Glauber Rocha’s films individually, I’ll relate only my experience and interpretation of them, since there are already many studies out there that attempt to place his films historically and aesthetically (my bibliography has a wide cross-section of books and texts on Rocha in English, Portuguese, Spanish, Italian and French). In the interest of full disclosure, there are still films of his I’ve not seen. They are: 1968 (1968), Cabeças Cortadas (1970), História do Brasil (1974), and Claro (1975). I also haven’t seen the belatedly discovered As Armas e o Povo (1975), or the incomplete A Cruz na praça (1959). Out of the rest, all are major films in my estimation, though my personal favourites are (in order of preference): A Idade da Terra (1980), Di Cavalcanti (1977), and Terra em transe. I’ll never forget the first time I saw Terra em transe, at a time when Rocha was barely a footnote in my Tarantino-dominated universe. The film opens in helicopter shot. Drums are pounding on the soundtrack. A vast tropical landscape. The titles announce the place as El Dorado – as we know, a fictional country that’s a thinly veiled Brazil – and soon the camera is at ground level, swooping around a sweaty José Lewgoy. He throws some papers in the air, and is chased by a mob, apparently journalists. There’s a machine gun. His bodyguard is holding it, though the lefty hero of the film, played by Brazilian soap opera heartthrob Jardel Filho, quickly grabs it and charges at Lewgoy. What the hell is going on? Soon Filho is seen breaking through a police roadblock. Seconds later he’s assassinated by two guards on motorcycles. In his last minutes of life he has expounded on the bourgeoisie, on militarism, on ingenuity, on poetry and the state of the people! And then, as if back from the dead, he’s narrating a letter to a loved one. Bam! A Catholic right-wing leader is dancing in the streets. He sweats, he preaches, he holds a large wooden cross. He’s the “white devil”, the callous, deceiving imperialist that you come to know in all of Rocha’s films, culminating in the absolutely fiendish and delirious Brahms in A Idade da Terra (1980). 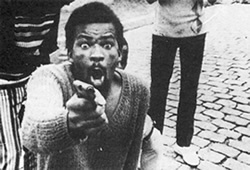 We [the Cinema Novo] understand this hunger that the majority of Europeans and Brazilians don’t understand… They don’t know where this hunger comes from. We know – we who make these sad and ugly films, these desperate films where reason doesn’t always possess the loudest voice, that hunger will not be cured by the planning of the cabinet [i.e. government] and that the strips of technicolor will not hide but amplify its tumors. That said, only a culture of hunger, looking at its own structure, can rise above itself, qualitatively speaking: it’s the noblest manifestation of cultural hunger and violence. It’s impossible not to recognise the self-conscious aspects of Rocha’s work; you can say he was never fully “lost” in his films – that pamphlet-style of ranting that punctuates the lyrically choreographed singing and dancing – and his best works, such as Der Leone Have Sept Cabeças (1970), alternate from moments of lucidity and integrated chaos to accidental chaos (13). Since there are no typical Rocha films, it’s not easy to isolate the subjective aspects – qualities that appeal to different sensibilities and different expectations – since that rides against his ultimate goal as an artist. Speaking personally, there are those of his films that penetrate me with their vitality – Deus e o Diabo, Terra em transe, Câncer (1968–72), Der Leone Have Sept Cabeças, and Di Cavalcanti – others that, plainly, leave me cold – Barravento, O dragão da maldade…, Jorjamado no cinema (1977) – and at least one that, at various moments during its long-ish runtime, fits into both camps, his final film, A Idade da Terra. 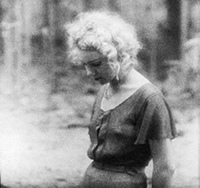 In many of these you find opposites: Barravento‘s classical narrative measured against the anarchy of Deus e o Diabo; Câncer, the “underground” experiment in 16mm, a freer, more intuitive vision than O dragão da maldade…, which he filmed directly afterwards; and the two documentaries, Di Cavalcanti and Jorjamado no cinema, one made officially as an assignment for television (Jorjamado), and the other (Di), an entirely improvised, spur-of-the-moment project, which is unofficial in every sense of the word since it was banned by the subject’s family and can’t be shown in Brazil to this day (download it here). A Idade da Terra, Rocha’s final film and most stylistically ambitious (35 mm ‘Scope) as well as his most costliest, collides all of his tendencies, and seems to be, almost by design, his most divisive work. A film in which the intensity is unfaltering – in this sense it seems clearly structured, though some have said, perhaps jokingly, that the reels are interchangeable – A Idade da Terra comprises a series of lengthy takes, beginning with the sun dawning over the Alvotafa Palace (home of the Brazilian president), and ending in a crowded parade where all the characters have disappeared into. In between, there’s the Anti-Christ, Brahms (rightly compared to Falstaff by Sylvie Pierre), an American imperialist and destroyer of nature, and four Christs (indigenous, black, military, and warrior) – here a condensed panorama of all the characters in Rocha’s films. Each combats Brahms in his own way, mostly conveyed through speech since their actions are rarely foregrounded into the story. A Idade da Terra, Rocha said, was in part an homage to the style of films from the Boca do Lixo, an experimental film movement happening in parallel to the Cinema Novo. The Lixo filmmakers were directly inspired by José Mojica Marins, the horror film director, who Glauber also admired. In my opinion, not much has been made of the resemblance between Marins’ visualisation of hell in Awakening of the Beast (1970) – itself a stagy allegory on Catholicism from the perspective of four different characters – and Rocha’s own feverish sets in A Idade da Terra. Rocha’s career seemed to encompass all aspects of Brazilian film and culture, major and minor; even in his last effort, it was the little guys that he connected to. In the grander scheme of things, A Idade da Terra is the monumental culmination of a career that finds in the wake of all its desires this thing called the Earth. And in it, Glauber Rocha belongs to all of us. Roy Armes, Third World Film Making and the West, University of California Press, Berkeley, 1987. Ivana Bentes, A Missão e o Grande Show: políticas culturais nos anos 60 e depois, Tempo, São Paulo, 1999. Ivana Bentes (ed. ), Glauber Rocha Cartas ao Mundo, Companhia das Letras, São Paulo, 1997. Serge Daney, “La mort de Glauber Rocha”, Libération, August 24, 1981. Michel Delahaye, Pierre Kast and Jean Narboni, interview with Glauber Rocha, Cahiers du cinéma, no. 214, July–August 1969. Michel Estève, (ed. ), Études Cinématographiques, nos. 93, 97, 1972/3. Paula Gaitán and Ava Rocha, From Hunger to Dream: Work, Politics, and Thought, MALBA Museum, Buenos Aires, 2004. Simon Hartog, “There’s Nothing More International Than a Pack of Pimps: A Conversation between Pierre Clémenti, Miklos Janscó, Glauber Rocha, and Jean-Marie Straub”; accessed at http://www.rouge.com.au/3/international.html; originally in Cinematics, vol. 2. Randal Johnson, Cinema Novo X 5, University of Texas Press, Austin, 1984. Randal Johnson, Antonio das Mortes, Flick Books, London, 1998. Randal Johnson and Robert Stam, Brazilian Cinema, Revised Edition, Columbia University Press, New York, 1995. Lino Micciche, Glauber Rocha, saggi e inventtive sul nuovo cinema, ERI/RAI, Rome, 1986. Paulo Antônio Paranagua (ed. ), Le cinéma brésilien, Centre Georges Pompidou, Paris, 1987. Sylvie Pierre, “Cela s’appelle l’aurore”, Cahiers du cinéma, no. 195, November 1967. Sylvie Pierre, Glauber Rocha, Cahiers du cinéma, Paris, 1987; Papirus Campinas, 1996. Glauber Rocha, Revisão Crítica do Cinema Brasileiro, Ismael Xavier and Augusto Massi (eds), Cosac & Naify, São Paulo, 2003. Glauber Rocha, A Revolução do Cinema Novo, Ismael Xavier (ed. ), with introduction by Cacá Diegues, Cosac & Naify, São Paulo, 2004. Glauber Rocha, O século do cinema, Alhambra/Embrafilme, Rio de Janeiro, 1983. Martin Scorsese, homage to Glauber Rocha, Cahiers du cinéma,no. 500, March 1996. Claudio M. Valentinetti, Glauber: Um Olhar Europeu. Pontos sobre Brasil, Prefeitura do Rio, Instituto Lina Bo e P. M. Bardi, Rio de Janeiro, 2002. Various, Glauber Rocha, with introduction by Paulo Emílio Salles Gomes, Paz e Terra, São Paulo, 1991. John Wakeman, World Film Directors: Vol. 2 (1945–1985), Hw Wilson Co., New York, 1988. Ismail Xavier, Allegories of Underdevelopment: Aesthetics and Politics in Modern Brazilian Cinema, University of Minnesota Press, Minneapolis/St. Paul, 1997. For an extensive list of articles in French, check out Sylvie Pierre’s Glauber Rocha (see above). Pierre also cites the greatest interview with Rocha as one from the Peruvian magazine Hablemos de cine, no. 47 (May–June 1969). I have never read nor seen this interview. Download one of Rocha’s greatest films, Di Cavalcanti. Natalia Brizuela discusses Rocha and de Andrade’s representations of Brazil in their films Terra em Transe and O Reid a Vela. “Eztetyka da fome” – a manifesto, written in 1965, that attempts to situate the Cinema Novo with its contemporaries. In it, Rocha calls for a revolutionary cinema that expresses the violent outrage of an underprivileged mass. Terra em transe is also known in the English language world as Land in Anguish, Earth Entranced, and a number of other variations. Deus e Diabo na Terra do Sol (1963) is known mainly as Black God, White Devil, and O Dragão da Maldade contra o Santo Guerreiro (1969) – which translates, roughly, as The Dragon of Wickedness vs. The Warrior Saint – was blessed Antonio das Mortes. “I write these words with anger. Intense anger…anger for the entire world, since Glauber was assassinated by a holy alliance of said progressive intellectualism and of the worst kind of fascism…More than his two lungs, Glauber died of exasperation…condemned by Brazil, which he loved so much…” So wrote Pedro del Picchia in Folha de S. Paulo, August 23, 1983. As Sylvie Pierre writes, this kind of indignation and accusatory criticism was typical after Rocha died. From a poll conducted by the excellent Brazilian magazine Contracampo (no. 27), which can be viewed here. The other films in the top ten are (in ranking order): Limite (Mário Peixoto, 1931), Terra em transe, Barren Lives (Nelson Pereira dos Santos, 1963), The Red Light Bandit (Rogério Sganzerla, 1968), Cabra Marcado Para Morrer (Eduardo Coutinho, 1964–84), Macunaíma (Joaquim Pedro de Andrade, 1969), Ganga Bruta (Humberto Mauro, 1933), São Paulo, S.A. (Luís Sérgio Person, 1964), A Hora e a Vez de Augusto Matraga (Roberto Santos, 1965), and Os Fuzis (Ruy Guerra, 1963). The Brazilian Cinema Novo, as it were. There were, of course, more “members” than listed here, and other tangential figures, such as Glauber’s first wife and later muse to Rogério Sganzerla, Helena Ignez, who I have not mentioned. Too many personalities to list. A book that talks about many of the minor Cinema Novo figures is Paulo César Saraceni’s Por dentro do Cinema Novo, Minha viagem, Editora Nova Fronteira, Rio de Janeiro, 1993. At the ripe old age of 25! 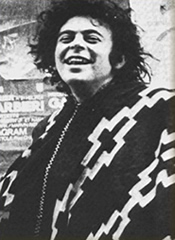 “At age twenty he was the central figure of Bahian cultural life”, stated Román Gubern in Cine contemporáneo, Biblioteca Salvat, Barcelona, 1973. Original Portuguese title: Revisão Critica do Cinema Brasileiro (see bibliography). Translated from Portuguese by author. Except where noted, quotations are taken from original Portuguese language sources. Brazilian poets, often cited by Rocha. Brazilian author; his book Vidas Secas (1938) was adapted into Nelson Pereiro dos Santos’ film of the same title (and known as Barren Lives in English). Anecdotally, it’s said that Jean-Pierre Léaud had moments of hysteria on the set of Der Leone Have Sept Cabeças that the African extras, continuing to act naturally, thought were part of the film. Gabe Klinger was born in Brazil, but has lived in the US and Europe since the age of 6. He is currently based in Chicago.